Make kitsch look cool and get one of your five a day all in one sitting. This short-sleeved shirt from River Island features SS17’s returning trend, the Cuban collar, as well as an all-over print that’ll take you from pineapple to fineapple. Available at River Island, priced £25. A look is only as good as its weakest link, so it pays to do even the smallest details well. Adding to its banger-packed assortment of stripped-back sneakers, New York-based Common Projects also turns out high-quality accessories like this textured tan leather cardholder. Available at Style.com, priced £70. Topman launched a killer new denim line-up this week, including four all-new styles. So forgive us that we almost missed this. Shirt + jacket = shacket. Shirt + jacket + Cuban collar = …we’re not even going to try. Available at Topman, priced £50. It’s fair to say our shores would be a lot less stylish without Paul Smith. 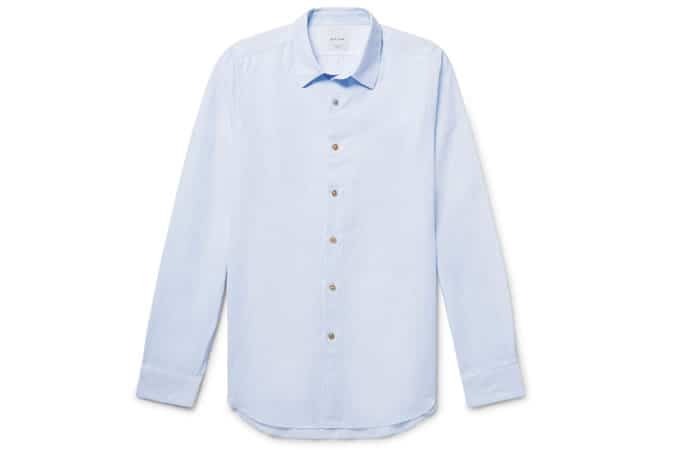 This week the British design legend dropped an exclusive capsule collection at Mr Porter, which as well as a range of things we’d have to sell off a few organs to afford, includes this expertly-cut slub cotton shirt. Available at Mr Porter, priced £170. Providing you can tolerate terrible jokes from elderly relatives like ‘could you not find trousers that fit you?’, New Look’s take on the cropped trouser trend will serve as an indispensable addition to any casual roster. Available at New Look, priced £24.99. French tennis brand Spring Court first hit the, well, court with its sneakers in 1936 and in the decades that followed became a staple on the feet of cool people from John Lennon to David Hockney. Today, the original G2 model, recognisable by its four ventilation holes, is available in a range of colours including this on-trend green hue. Available at The Idle Man, priced £66. The iconic crocodile logo has been a fixture on Lacoste polo shirts for the best part of a century. And this season, snappy dressers that pick up the brand’s latest collaboration with Paris-based artist Yazbukey will be joined by an extra tennis ball-shaped emoji. Available at Lacoste, priced £120. Making cycling stylish is no mean feat, mainly because 90 per cent of the time you’re dressed up like a Lycra-clad condom. 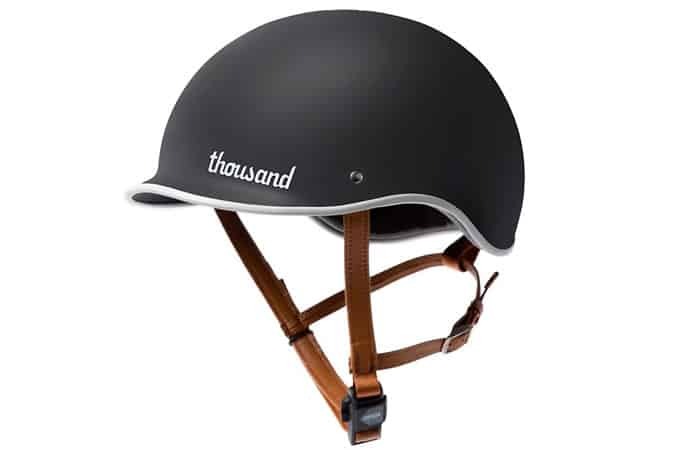 But at least LA-based brand Thousand is making bonces better-looking with its range of vintage-inspired helmets. Available at Bear & Bear, priced £85. As a forward-thinking men’s publication, we loathe to say anything that sounds like it belongs in a nineties lad’s mag. But when it comes to denim, as is the case with these light wash jeans from G-Star, we say let’s get battered. Available at G-Star, priced £120. In 2015, between pumping out new versions of the Ultra Boost and working with some guy called Kanye, Adidas found time to invent the NMD. The Primeknit kick has been a best-seller ever since, and it’s easy to see why with new iterations like this all-over striped version. Available at Adidas, priced £129.95. The season of the mankle is upon us; but for guys shuddering in fear at exposing their lower legs, sock it to ‘em with a pair of Pantherellas. The British firm has gained a reputation for turning out some of the best socks in the game and has just updated its line-up with a range of spring-ready colourways. Available at MatchesFashion, priced £12. A lot of times fashion is about buying things you don’t need. So shout out to Danish brand Soulland for labelling this white cotton T-shirt exactly what it is and making the world’s ugliest font – Comic Sans – kind of, well, cool. Available at FarFetch, priced £51. It’s not down to men to wear something ‘old’, something ‘borrowed’ or even something ‘blue’, but we can’t resist something new, especially this geometric print pocket square from Thomas Pink’s new wedding collection. Available at Thomas Pink, priced £35. There’s an old saying about Britain that if you don’t like the weather, just wait a few minutes. At no other time is this truer than during spring. Luckily, duffle coat specialist Gloverall has produced a lightweight, unlined summer version of its staple coat. So you don’t have to worry about getting soaked (by sweat or showers). Available at Gloverall, priced £225.